Dr. Hoffstetler (Michael Stuhlbarg) offer a hand of support to Elise (Sally Hawkins) and her new, amphibious friend (Doug Jones). In what is a naturally beautiful and bleakly ominous opening tracking shot we are exposed to the daily routine of Hawkins' Elisa as she bathes, and pleasures herself, and shines her shoes, and gets ready to go to work only to be late and have her co-worker, Zelda (Octavia Spencer), clock her in to the dismay of fellow co-workers. A crucial detail we come to realize soon after Elisa enters her place of work is the fact she is mute and so her mousy facade is not completely due to the fact she has a meek personality, but more because she has been forced into as much of a personality by this disability. In her work as a janitor on the night shift at this facility Elisa is often relegated to as much of a routine as she seems to fill her own, personal life with. That is, until one evening when the likes of Colonel Richard Strickland (Michael Shannon) arrives with the aforementioned creature that he supposedly discovered in the rivers of South America. The arrival of this amphibious humanoid creature (played oh so poetically by del Toro regular Doug Jones) sparks something of an immediate connection with Elise when she isn't even fully aware of what lies within the coffin-sized tank that Strickland and his men roll in. As these things go, The Shape of Water then lapses into some rather typical storytelling traps in terms of Shannon's clearly defined bad guy and his superiors having the intention of killing the creature and harvesting the body for ways in which they might get ahead in the space race or other competitions with other countries whereas the undoubtedly more intelligent, but less important scientists, namely Robert Hoffstetler (the wonderful Michael Stuhlbarg), request to study the creature to better understand him, his species, and to paint a more well-rounded picture of our own world. These varying perceptions of what the right thing to do with the "asset" play out more or less as one expects though del Toro and co-writer Vanessa Taylor (Hope Springs, Divergent) certainly try their best to throw in a few twists. Essentially, this storyline plays out alongside that of Elise and Jones' creature from the black lagoon better getting to know one another and coming to better understand one another until Elise is tasked with a critical decision that will ultimately lead to the survival of the sea creature or his certain demise at the hands of the increasingly psychotic Strickland. This simple throughline plot of the good guys interest versus the bad guys interest brewing until one or the other takes preventative action is one that almost makes the film less mythic, but thankfully this isn't the story the film hinges on-that would be the one where each of these well-drawn characters interact and form relationships through the beats of the tired plotting just described. This is where The Shape of Water draws both its most beautiful moments and expresses its deepest ideas. It is in these characters and the dynamics that develop between each of them that the whole conceit of the film comes to feel complete. Of course, this movie belongs to Hawkins and she is operating on a whole other level here as she doesn't speak a word in the film and yet we are almost immediately on her side. We trust, simply by the honesty exposed and the almost private preference we can see Elisa possesses that she has settled into a role in the world where she knows she can function well-enough. In other words, Elisa has found a content way to exist despite it being 1962 and despite the lack of any technological advancements that might assist in her inability to speak. She lives in a loft above the Orpheum in Baltimore in what is a choice that will inherently appeal to every cinephile in the audience as del Toro will casually pan down from the floor level of Elisa’s apartment into the nearly empty, but ornately designed theater house. Elisa also lives next door to a closeted painter, Giles (Richard Jenkins), who seems to have been pushed out of his marketing role at a major corporation to now only being commissioned to paint certain adverts and thus spends much of his time inside his loft and with Elise. These two, together with Spencer's Zelda, form this gang of outcasts that band together to not do what necessarily all of them even believe in, but more to help Elise because they know no one else has ever believed in any of them and out of this respect and obvious care for one another The Shape of Water becomes this tale of these people in pain and how they have learned to cope with the cards the world has dealt them. Whether any of them were ready or not this feeling of responsibility comes to fruition when they realize they can make a real difference in the life of their fellow (mer) man who has been dealt a similar hand. It is in these intensely executed escape scenes and further, into the moments we are allowed to be a fly on the wall for that pertain to Hawkins and this creature wordlessly coming to understand and be one with each other that the film diverts the story expectations and takes on the meaning implied by del Toro's grand sense of tone. It is in these scenes where we understand the idea del Toro was seemingly chasing from the conceit of this story. And it is through Hawkins and Jones' ability to capture this unspoken bond between these two characters have that made this viewer in particular feel more involved in the story and more invested in the relationship between these two beings that might otherwise have felt too weird or taboo in terms of buying into the authenticity of it. As it is presented by the delicate Jones and the elegant Hawkins though, there is a pureness and even a certain amount of naiveté that is easy to expect in any new relationship, but hard to capture on film and The Shape of Water just nails it. 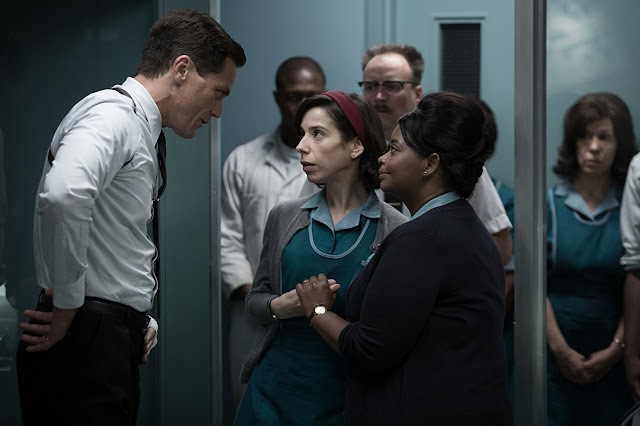 Government agent Strickland (Michael Shannon) interrogates Elise and her friend Zelda (Octavia Spencer) after the escape of the sea creature. Interestingly enough, The Shape of Water doesn't relegate itself to a specific kind of movie despite coming off initially as another dark fable from del Toro. The gist of the movie comes from this underground facility setting and the aforementioned conflict that would seemingly place it automatically in the realm of some kind of horror movie and while there are certainly elements of such-this would be nothing new for del Toro-it is just as much a love story as anything else with that love story in turn making the film something of a love letter to different kinds of cinema throughout Hollywood's past. Thankfully, the film references such moments where it leans toward the science fiction side of things or will swing to the opposite end of the spectrum and have an ode to musical numbers of yesteryear in ways that don't feel cheap or imitative, but more as a genuine homage to such genres from characters who communicate or relate to those kinds of movies and worlds. 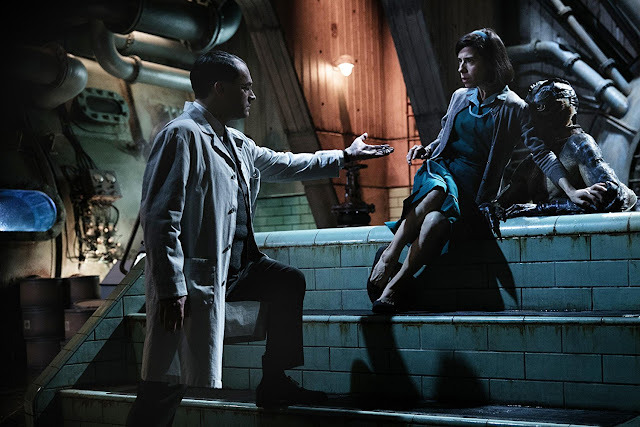 While such a mixed bag might typically lead one to think a singular project is trying to do too much and will fail to have a distinct voice because of as much, The Shape of Water mixes these genres not for the sake of style or tone, but to bring out and better define the personalities of these characters who can't speak for themselves. 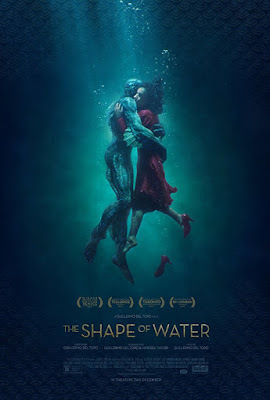 That said, this also makes for the overall story being one of del Toro's more accessible narratives in the way that it aligns more with the average movie-goer's expectations of story and plot than some of his other work. That isn't to degrade the film in any way, but more to say that after Crimson Peak, where del Toro's prowess for designs and details were on full display while his narrative leaned a little too much into the traditional side of things, that The Shape of Water finds a better balance of being both everything we expect from the auteur from an aesthetic perspective while providing a story that is both clearly understandable as well as multi-layered. It is also in this aspect that I tend to find my only complaints about the project and not necessarily complaints in terms of things I didn't like about the film-I generally admired everything and everyone that was on screen and all they were working together to accomplish-but more in regards to my lack of investment in the events as they unfolded despite caring about the characters involved. It is almost impossible not to be moved in some manner by this core relationship between Elise and the sea creature as well as in the endeavors of those surrounding our core couple (you can't go wrong when you have Shannon and Stuhlbarg in a movie together), but in terms of the movie overall, what moves these characters through the plot, and what determines their fates-I simply wish I cared more as the final act climaxed and those fates were revealed. I wanted to feel more. The Shape of Water is a well-executed metaphor for falling in love with someone different from yourself or finding love in a place you least expected it, but given how moving the film can be in its best moments I wish it was more memorable than it ultimately turns out to be.